Ever since joining the Celtics, Isaiah Thomas has done his best work in the fourth quarter of games. That pattern continued against the New Orleans Pelicans on Friday night. The 5-foot-8 point guard erupted for 12 points in the opening four minutes of the final frame, enabling the Celtics to break open a three-point game with a 14-5 run. Thomas ended up scoring 14 of his team-high 27 points in the fourth quarter, as that outburst carried the Celtics to an impressive 104-98 victory in their first contest of a three-game road trip. 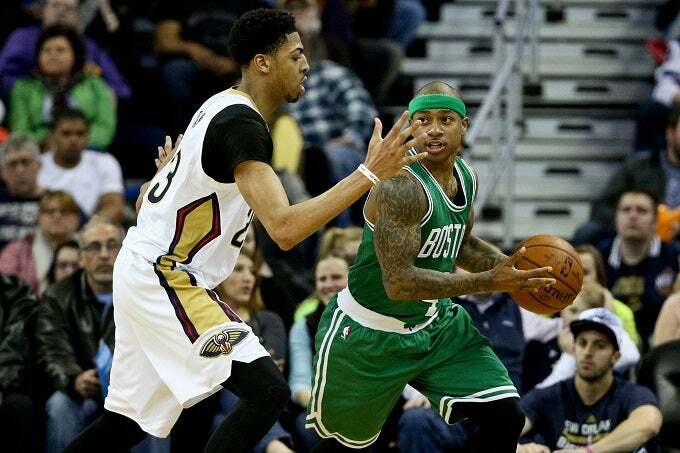 Anthony Davis had a game-high 29 points and 14 rebounds for the hosts in the setback. Brandon Bass added 17 points and six rebounds for the visitors, while Evan Turner chipped in 16 points, 6 rebounds and 6 assists, but it was Thomas’ late-game performance that stole the show. The sixth man, who has averaged 8.7 points per game in the fourth quarter since joining Boston, had his most efficient performance of the year. The 26-year-old delivered 8-of-13 shooting (4-of-6 shooting beyond the 3-point arc) with three assists over 29 minutes. Three of those 3-point shots came during the fourth quarter. The shorthanded Celtics were without starting shooting guard Avery Bradley (left elbow sprain) during the crucial victory. He is unlikely to rejoin the Celtics on the team’s road trip. Boston kept pace in the Eastern Conference playoff race with Friday’s performance. They still remain just 1.5 games out of the final playoff spot heading into Sunday’s matchup with the Orlando Magic.